Ladies and gentlemen... dig through your cookbooks, scour the internet, or call up grandma for her secret recipe and start your mixers!! The Rotary Club of Baldwin Park invites anyone and everyone to enter their favorite apple pie recipe for judging by a select group of experts. 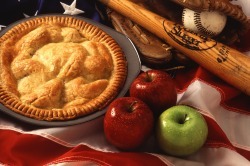 Judging is based on appearance, crust, taste, and overall "apple pie-ness." So as you can tell, things can become quite technical. - Each contestant must submit two pies per recipe in disposable 9" pie plates (pie plates will not be returned). - A registration form with the full list of ingredients and a $5 registration fee must accompany each entry (Click here to print the form). - Each person may enter multiple recipes (but you still need to provide two pies for each recipe). - Pies must be delivered to the designated judging area in the New Broad Street Realty Office (4926 New Broad Street) between 4pm to 5pm on July 3rd. 4. Overall - Judges taste filling and crust together and rate on the symbiosis of the two. Each judge assigns a numerical value (1-5) in each category. Once all the pies have been judged, the results are tallied on the spot with all four categories receiving even weight in the process (each category counts for 25% of the total). There are no statistical variances involved in the tally, just straight arithmetic. The entry with the highest point total wins. In the case of a tie, we will have a tie-breaking judge pick the winner. Besides the glory and high acclaim of having the best homemade apple pie in all the land, the winner will also take home a fabulous cash prize! The amount will be equal to half of all the registration fees, so it will be based on the number of entries received on the day of the event. The second and third place winners will receive non-cash prizes. Pie slices of all pies will then be sold for $3/slice and all proceeds from the sale will used by the Rotary Club of Baldwin Park to fund its many activities and service projects. Got a question, comment, or suggestion? Email Lily Wu at purelilyliving@gmail.com.